Pope to Visit Mexico in July to Canonize Juan Diego. Juan Diego was born in Mexico and lived a simple life as a weaver, farmer and laborer. Juan was a member of the Chichimeca people (an Indian tribe). They called him the talking eagle. His Christian name was Juan Diego. On December 9, 1531, Juan rose before dawn to walk fifteen miles to Mexico City to attend daily Mass. As he passed Tepeyac Hill, he heard music and saw a glowing cloud encircled by a rainbow. A woman’s voice called him to the top of the hill. There he saw a beautiful young woman dressed like an Aztec princess. She said she was the Virgin Mary and Mother of the true God. She asked Juan to tell the bishop to build a church on that site, so she could be present to help and defend those were suffering and in pain. After Juan’s mission was completed, he became a hermit. He spent the rest of his life in prayer and penance. His little hut was near the first chapel that was built on Tepeyac Hill. He was greatly respected and parents wished their children would grow up to be holy like Juan Diego. Juan took care of the little church and met the pilgrims who began to come there to honor their Mother of Guadalupe. He would show them the miraculous tilma or cloak that preserves Mary’s beautiful image. The pope personally visited the magnificent church of Our Lady of Guadalupe and prayed there for all of the people of Mexico. He prayed especially for those who were killed during the terrible persecution of the Church in the early part of this century. An he prayed for all the pilgrims who come to this beautiful church with such faith in the Mother of God. Collect: Lord God, through St. Juan Diego you made known the love of Our Lady of Guadalupe toward your people. Grant by his intercession that we who follow the counsel of Mary, our Mother, may strive continually to do your will. We ask this through our Lord Jesus Christ, your Son, who lives and reigns with you and the Holy Spirit, one God, for ever and ever. Amen. Today the Church in the United States celebrates the optional memorial of St. Juan Diego, an Indian convert, to whom the Virgin Mary appeared as he was going to Mass in Tlatlelolco, Mexico. Our Lady asked him to tell the Bishop that she desired a shrine to be built on the spot to manifest her love for all mankind. She left a marvelous portrait of herself on the mantle of Juan Diego as a sign for the Bishop. This miraculous image has proved to be ageless, and is kept in the shrine built in her honor, the Basilica of Our Lady of Guadalupe, Patroness of the Americas. Little is known about the life of Juan Diego before his conversion, but tradition and archaelogical and iconographical sources, along with the most important and oldest indigenous document on the event of Guadalupe, “El Nican Mopohua” (written in Náhuatl with Latin characters, 1556, by the Indigenous writer Antonio Valeriano), give some information on the life of the saint and the apparitions. When he was 50 years old he was baptized by a Franciscan priest, Fr. Peter da Gand, one of the first Franciscan missionaries. On December 9, 1531, when Juan Diego was on his way to morning Mass, the Blessed Mother appeared to him on Tepeyac Hill, the outskirts of what is now Mexico City. She asked him to go to the Bishop and to request in her name that a shrine be built at Tepeyac, where she promised to pour out her grace upon those who invoked her. The Bishop, who did not believe Juan Diego, asked for a sign to prove that the apparition was true. On December 12, Juan Diego returned to Tepeyac. Here, the Blessed Mother told him to climb the hill and to pick the flowers that he would find in bloom. He obeyed, and although it was winter time, he found roses blooming. He gathered the flowers and took them to Our Lady who carefully placed them in his mantle and told him to take them to the Bishop as “proof”. When he opened his mantle, the flowers fell on the ground and there remained impressed, in place of the flowers, an image of the Blessed Mother, the apparition at Tepeyac. Much deeper than the exterior grace of having been chosen as Our Lady’s messenger, Juan Diego received the grace of interior enlightenment and from that moment, he began a life dedicated to prayer and the practice of virtue and boundless love of God and neighbour. The miraculous image, which is preserved in the Basilica of Our Lady of Guadalupe, shows a woman with native features and dress. She is supported by an angel whose wings are reminiscent of one of the major gods of the traditional religion of that area. The moon is beneath her feet and her blue mantle is covered with gold stars. The black girdle about her waist signifies that she is pregnant. Thus, the image graphically depicts the fact that Christ is to be “born” again among the peoples of the New World, and is a message as relevant to the “New World” today as it was during the lifetime of Juan Diego. Symbols: Pictured carrying a tilma full of roses. Read Pope John Paul II’s homily at the canonization of St. Juan Diego. Pray to St. Juan Diego for migrant Mexican workers who come to the USA trying to support their families. If you know of a Mexican family who may need your help, surprise them with a food basket or offer them a ride if they don’t have a car. If you speak Spanish, see if they need an interpreter for an important appointment. Cook some Mexican dishes for dinner and bake a Rose Petal Pound Cake or other rose theme for dessert in honor of St. Juan Diego. Shrine of Our Lady of Guadalupe. Recommended Reading: For children: The Lady of Guadalupe by Tomie dePaola. For adults: The Wonder of Guadalupe by Francis Johnston. For music for Juan Diego’s and Our Lady of Guadalupe’s feast, see www.savae.org. The San Antonio Vocal Arts Ensemble have two of authentic music by Mexican medieval composers. Very beautiful! 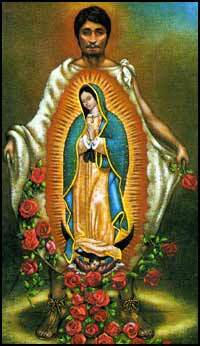 Visit Our Lady of Guadalupe, Patroness of the Americas for detailed accounts on the apparition to Juan Diego. You can also send online cards from this site. See also Patron Saints Index. Was Our Lady of Guadalupe Wrong? Relic From Guadalupe Tilma to Tour U.S. The Martyrdom of Blessed Miguel Pro, S.J.